The World of Gord: Movie Review - "Anchorman : The Legend Continues"
Movie Review - "Anchorman : The Legend Continues"
This afternoon Teen and I went to see Anchorman 2: The Legend Continues with Will Ferrell. We enjoyed the first Anchorman movie even though it was uneven and a little dumb and with the bar set low, headed out to see the sequel. With the '70s behind him, San Diego's top rated newsman, Ron Burgundy (Will Ferrell), returns to the news desk in "Anchorman 2: The Legend Continues." Also back for more are Ron's co-anchor and wife, Veronica Corningstone (Christina Applegate), weather man Brick Tamland (Steve Carell), man on the street Brian Fantana (Paul Rudd) and sports guy Champ Kind (David Koechner) -- all of whom won't make it easy to stay classy ... while taking New York's first 24-hour news channel by storm. What can I say? It's a dumb movie! There is the odd chuckle and odd laugh but it really a terribly stupid movie. 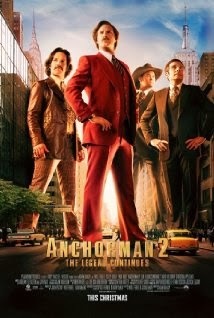 I have never thought that Will Ferrell was good enough to carry a movie himself. He is only good in small doses in supporting roles. This movie proves my point again. If you want to see this, wait till it comes on TV. It's not worth seeing at the theater. Good review. The first will always have a special place in my mind and heart, but this one did the trick in terms of being a comedy that actually made me laugh.